Post subject: C&NW 284 saved; will be restored to operation! The Hoosier Valley Railroad Museum is very pleased to announce a successful move of Chicago & North Western boxcar #284 this past week from Elk Grove Village, Illinois to the museum in North Judson, Indiana. Donated by Lawrence Foods to HVRM some time ago, the Pullman-Standard built PS-1 40' car was moved by highway, and has already been set back up on its trucks at HVRM. The historic car is an important addition to the Hoosier Valley's collection as it was built in Michigan City, Indiana at the former Haskell & Barker Car Company plant in October of 1953. The museum intends to restore the car into its original C&NW paint scheme, which includes "The Overland Route" lettering on one side, and "Route of the 400 Streamliners" lettering on the opposite side. We are looking for authentic full scale drawings and/or stencils for the cars lettering. We also welcome donations to the "C&NW 284 Fund" so that we can make the necessary repairs and get the car repainted and relettered back into its C&NW lettering as soon as possible. Once that is done, we will be able to add it to HVRM's historic freight train consist. Congrats Les on the Cheap and Nothing Wasted box car. Have an affection for anything CN&W. No money, but best fishes. Seriously, glad it was saved. John. Having just moved our PS-1, 40' over the road in December, the day after the first 24" snow storm, I know just about how much it cost you. We have an advantage in that ours is completely restored and only needs to be lettered. And fortunately, ours is still on it's original trucks. Congratulations to HVRM on getting the "new" boxcar! This car is worthy of preservation, and if you hadn't done it, IRM was going to be there in a few months with its own truck and crew. Approvals were set up and a fund was accumulating. Funny how much competition there is for such a simple piece of hardware. However, it is a "billboard car" after all. Thanks for posting the photo. For the record, there are two other C&NW 40' steel boxcars on the same siding at Lawrence Foods that C&NW #284 was sitting on. If IRM has a fund going to "rescue" the 284, perhaps they can transfer those funds to one of the other two cars. Both of these are in similar (maybe slightly better) condition. BUT, better hurry because the folks at Lawrence Foods told us when we asked about the other cars, that they intend to put in an addition to the west end of the building that will effectively "lock" the two cars into the siding and they believe that the other two cars will eventually be cut up on site. I hate to see any vintage freight cars scrapped, so if there is any chance that IRM could get at least one of those cars out of there, that would be great! Unfortunately, I don't have any info on the other car numbers. The other 2 cars at Lawrence Foods are not available at this time. When I spoke to Matt about this car, I asked about the other 2. The other 2 cars will be used for storage till 2012, then they may be available at that time. The problem is that the building extension will block in the other 2 cars. It could be possible to move them with the building in place, but it would be difficult. I have some work to on the roof line of this car, but it should be a fairly easy fix which should get done this summer, with painting to taking place by the end of summer. I have been in contact with the C&NW Historical Society on the lettering for this car for about a month now, and Joe did come up with some info that may be useful. I spent 18 months working on this, and I was so happy when it finally arived last week. Congratulations to you and the folks at HVRM. The safari hunt for the elusive vintage freight car is so satisfying when one is found and brought back to civilization. Best of luck with your restoration. That is going to be one cool boxcar. It would have been a real gas to have gotten a single-digit numbered one from that series! Good luck on the lettering--- no vinyl allowed!! We haven't used vinyl yet, and hopefully won't in the future. As for the car number, the C&NW series of 40' PS-1 cars was numbered 1-625 I believe. Yes, a single digit car would have been great, but this number is pretty low I think. Who knows, maybe a single digit number is still out there somewhere sitting on someone else's siding! BTW, the Monon had a series of boxcars built starting with number 1, although they weren't PS-1 boxcars. The Monon did a series of ads with boxcar number 1, and it became quite famous in its own rite. Unfortunately, these cars were rebuilt and renumbered and whatever happened to the number 1, or the other low numbered Monon boxcars, is a mystery. Even the Monon Railroad Historical-Technical Society doesn't know. Last edited by Les Beckman on Tue Apr 13, 2010 10:33 am, edited 1 time in total. This is C&NW 336, of the same C&NW series (1-625) of PS-1 boxcars as number 284 at HVRM. Although the photo of the 336 was taken fairly recently (2012), I don't know that the car is still in existence today. The car was apparently at the Nebraska Railroad Museum which operated the FEVR tourist train for a number of years, but sold that operation a few years ago. Wasn't able to find any additional info about the car. Good to know that at least another of these cars survives, or did at least in 2012. 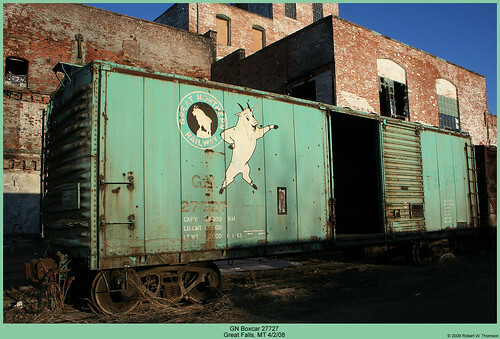 Les, so what is the latest with HVRM's C&NW boxcar? Has it been repainted yet? How about the other 2 boxcars? Are they still there or have they they found a home now too? I can't speak about the other two C&NW boxcars that were at Lawrence Foods. Perhaps someone else knows of their current status. As for C&NW #284, some work has been done on the rust holes on the body, but more needs to be done before she is sandblasted and then given a new paint job. With the cosmetic completion of Pennsylvania Railroad X50B boxcar PRR607627/PC 153177 (see that thread), Mark Knebel has requested a new car be moved into his "open air shop" for work. The Hoosier Valley train crew is shown below, moving C&NW "billboard" boxcar # 284 at the end of the day. Steve Henrichs is the conductor on the end of 284, with Doug Kosloske engineer and Stephen Bulla, Student Conductor. BTW, this is "The Overland Route" side of the car. Looking forward to Mark's upcoming work.